Every man who joins the commandos brings his own rifle or pistol, and he is also provided with a fighting knife, which is used by the commandos with particular effectiveness. In choosing the kinds of arms and equipment suitable for commandos, the determining factor was the type of operations in which they would engage. In the summer of 1940 the Germans were in positions along the coast line of Europe, from Narvik in northern Norway to Biarritz in southwestern France. Any part of this coast was within reasonable striking distance from the British Isles. In view of the Royal Navy's superiority at sea, the raiding opportunities for commando units seemed unlimited. The task was essentially one for an amphibious force…a sort of super-marines…who would fight only with equipment which could be carried on their backs from a boat to the beach. They would also need the guerrilla's traditional mobility on any terrain, which meant that vehicles larger than bicycles, and perhaps than a handcart, were not practicable. Any better means of transport would have to be captured at the scene of operations. Consequently, regulation requirements for the number an allocation of weapons are not prescribed, but in every case distribution is made according to the tactical requirements of the particular mission to be performed. Every man who joins the commandos brings his own rifle or pistol, and he is also provided with a fighting knife, which is used by the commandos with particular effectiveness. Each commando headquarters has a separate store of extra weapons so that extreme flexibility in armament is assured. A typical store contains: Bren guns; Thompson submachine guns; calibre .50 antitank rifles; 2-inch and 3-inch mortars with a supply of both smoke and high-explosive shells; defensive (fragmentation) Mills hand grenades; offensive (plastic body, concussion type) hand grenades; smoke pots; Very pistols; "knuckle dusters"; (brass knuckles); "Limpets" (magnetic, acid, high-explosive mines), one type suitable for use against ships and another for use against tanks; and demolitions of all types. 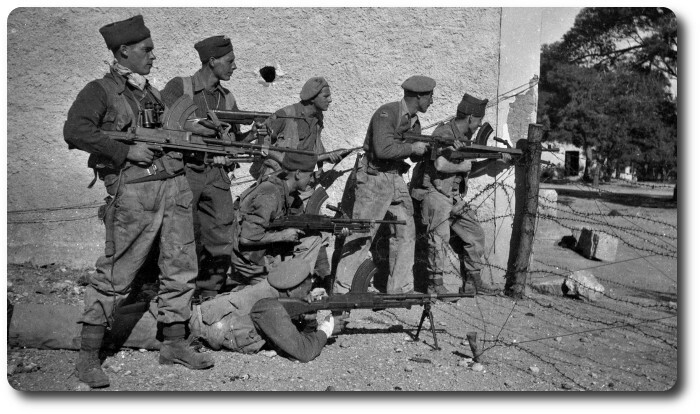 Each troops is equipped with Bren guns, Thompson submachine guns, an anti-tank rifle, and a 2-inch mortar; normally each sub-section is allocated one Bren gun and a submachine gun, the allocation of the anti-tank rifle and the mortar being left to the discretion of the troops commander. The clothing and equipment furnished commandos includes a variety of types. Normal clothing is "battle dress," a two-piece woolen garment, stout shoes, and leggings. In colder weather a sleeveless button-up leather jacket which reaches the hips is worn over or under battle dress; a two-piece denim dungaree is also provided for wear over battle dress in damp or rainy weather. The men are further equipped with cliff-climbing and with hauling materials, such as rubber soled shoes and toggle-and-eye ropes. A wool undervest and a heavy-ribbed wool cardigan with long sleeves and turtle neck are also available for cold-weather wear. All clothing is designed and worn solely with a view to comfort and utility under actual operating conditions. No leather belts are worn either by officers or enlisted men; a fabric waist-belt is provided. In addition to his weapons, the individual soldier generally receives such items as these: Tommy (individual) cooker; lensatic compass; skis and poles; individual waist life-bet ("Mae West"); Primus stove; 1-gallon thermal food-container; gas cape; wristlets. Troops are equipped with two-man rubber boats; plywood (sectionalized) canoes; collapsible canvas canoes; bamboo and canvas stretchers; 2-inch scaling ropes; 1-inch-mesh heavy wire in rolls for crossing entanglements; and toggle ropes. Transportation equipment for each commando includes Hillman pick-up 1,500-pound trucks, motorcycles, and one 3-ton truck. Communication equipment for each troops includes a number of portable radio sets, voice-and-key type, weighing 36 pounds with a voice range of 5 miles; semaphore flags; blinker guns; Very pistols and flares.